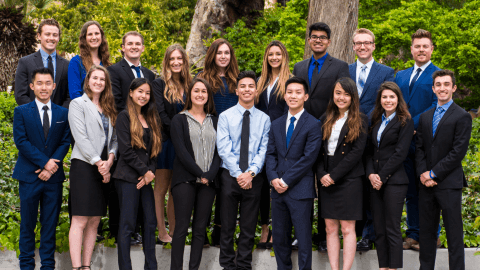 Cal Poly AMA is led by a selective group of responsible, motivated, and driven Cal Poly students. The board ensures that the club runs as a cohesive organization and its members benefit from all aspects the club has to offer. Note: Click on a board member’s photo to view his/her LinkedIn page. AJ is a third year Business Administration – Marketing major from Calabasas, CA. He is minoring in psychology and aspires to work in tech sales. On campus, he works event staff for the athletic department and is a student assistant at the library. He is excited about this year’s AMA events and hopes to inspire members. Krystal is a third year Communication Studies major with a minor in Integrated Marketing Communications. Her very first involvement with AMA was being on the nationals team as a freshman, and will be leading the team this year. In her free time, she enjoys researching new food places to eat, picking up a new read and discovering new music. Brianna is a third year business student concentrating in Quantitative Analysis. Outside of AMA, she is a Career Peer Advisor for OCOB and is a member of Gamma Phi Beta. She enjoys running, exploring SLO, and soaking in the sunshine with friends. Yohana is a 2nd year Business student concentrating in Marketing. She has been involved with AMA since her freshman year and enjoys taking on leadership positions. On campus Yohana is also involved with Delta Gamma as the marketing and social media chair, she is a campus representative for The Social Life clothing company and is the writer and creator of her own personal blog called My Shades of Blue. Outside of her work/school life Yohana enjoys surrounding herself with people, going line dancing, painting, and making others laugh. Hailing originally from overseas in England, Thom is a transfer student in his Junior year at Cal Poly. He is a student of the College of Business, studying Business Administration, with a concentration in Marketing and an IMC minor. 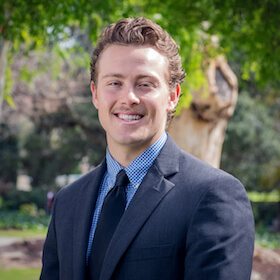 Working closely with a team of students, Thom helps to head the marketing division of the Cal Poly AMA. 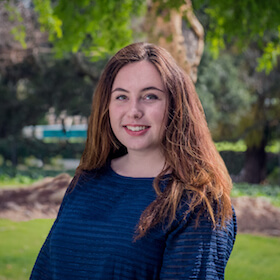 Involved on and off of campus, Thom is a current OCOB Marketing Mentor and works as the Marketing Intern at Hathway, a local agency focussing on the digital consumer experience. In the free time he has remaining, he enjoys surfing in his current town of Pismo Beach, drinking great craft brews, sipping a great cup of coffee and riding his motorcycle through the hills. people from all different backgrounds, and staying up to date on current events has interested her in pursuing a career in the Media industry. When Julia isn’t busy studying in Scout Coffee Co., she is spending time with her friends and family or going for a run outdoors. Blake is a 3rd year Business Marketing major and Integrated Marketing Communications minor from the Bay Area. 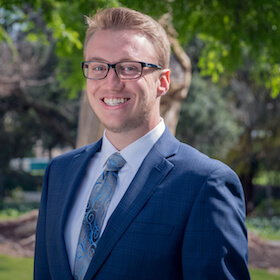 His experiences at Cal Poly and throughout several Marketing Internships have made him passionate about marketing and how it can be used for the betterment of society. Blake has been involved with AMA since the beginning of his freshman year. He enjoys hiking, running, music and being by the water. 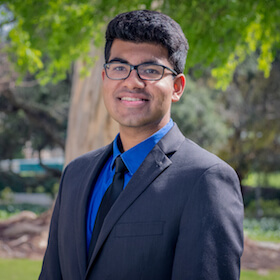 Vaidya is a 3rd year Political Science minoring in Integrated Marketing Communications. 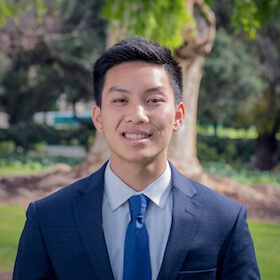 He has been involved in AMA since his 2nd year at Cal Poly, and is also involved in Alpha Kappa Psi as the current Vice President of Communications. 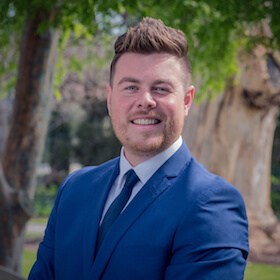 Within San Luis Obispo he is a marketing intern for both JoyRun and AMF Media Group. He is interested in pursuing a career in marketing in the near future, since it’s the coolest thing about business! He is passionate about friends, family, politics, videogames, sports, the outdoors, and Netflix. 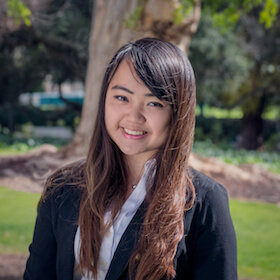 Alisa is a 3rd year Business Administration Major with a concentration in Marketing. 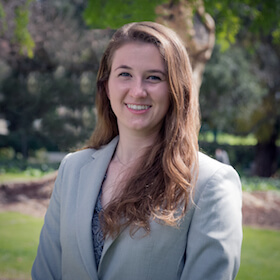 She transferred to Cal Poly in Fall 2017, and immediately got involved in AMA as the Company Liaison for the 2018 MCC, which opened the door for her to plan this year’s conference! She is also the president of the Association of Transfer Students, so if you or anyone you know is a transfer student, she’d be happy to answer any questions or help get you more involved! Larry is a 2nd year Business Administration major with a concentration in Information Systems. 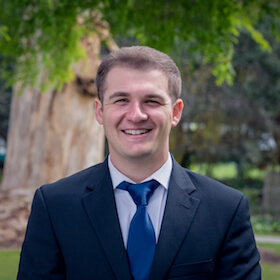 He has gained experience through several marketing positions but is very interested in the future of information in Business, so why not do both? If you ever need him, always check the rock wall or any other place to climb! 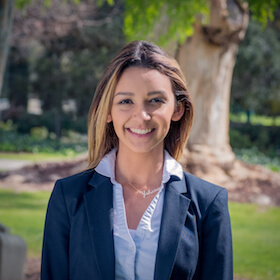 Tali is a 2nd year Business Administration major from the Bay Area concentrating in Marketing and minoring in Statistics. 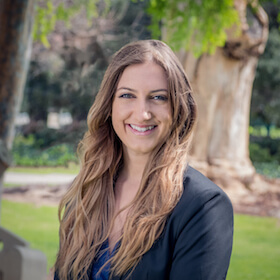 She’s a Marketing Mentor for OCOB, Director of Marketing for a startup called Poly Canyon Ventures, and president of the Russian Student Association. In her free time, she enjoys exploring SLO, painting, and traveling. Minna Friedlander is a 3rd year Graphic Communication major concentrating in Web and Digital Media. She is also pursuing a minor in Ethnic Studies. She is very passionate about web design and development, and eager to explore new opportunities in user experience and user interface related work. David is a 3rd year Business major with a concentration in marketing. 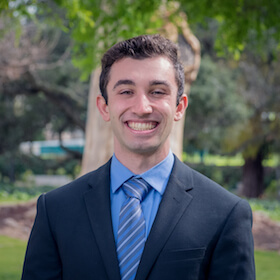 He has been involved with AMA since Fall Quarter of 2017. Outside of AMA he has an on-campus job with the Dean of Students Marketing Team, which is where he has worked since his freshman year. Outside of marketing David has a strong passion for graphic design and its applications. He literally wears his interests on his sleeve with a good chunk of his clothing based on sports, movies, tv shows, music, etc. His most favorite interest is meeting new people, so be sure to strike up a conversation with him if you ever want to talk! Noah is a 2nd year Graphic Communication major from Los Angeles. He has had a few jobs in Digital Marketing and has a passion for Photography and Graphic Design. 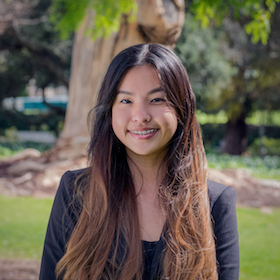 Vivian is a 1st year Business Administration major from San Jose, planning to concentrate in marketing. 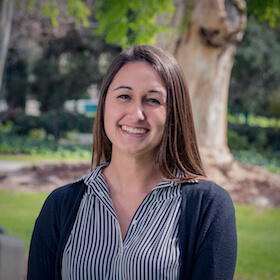 She’s been involved with AMA since her first quarter at Cal Poly and started off as the Social Media Manager. She is also involved with Alpha Kappa Psi, and enjoys going to concerts, eating good food, and clothes. Feel free to talk to her about anything, from dogs to whether or not pineapple belongs on pizza! Alex Paulsen is currently a 3rd year Business major, concentrating in Marketing and also undertaking a Media Arts minor. 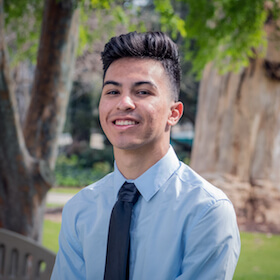 He explores his creative interests of videography and photography through this minor and other freelance working opportunities for Cal Poly clubs, ASI, and other campus organizations. In the future he hopes to pair his marketing experience with his creative passion by working in the entertainment industry. Katie is a 3rd year Business Administration major with a concentration in Marketing and a minor in Integrated Marketing Communications. 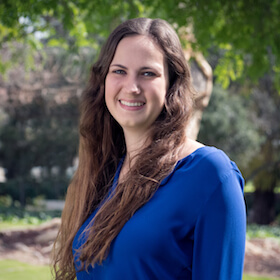 She is an Ambassador for the Orfalea College of Business, was a co-lead for the Marketing committee for Women in Business’ Defining Her Future Conference, and is a member of Alpha Omicron Pi. She is interested in a career in strategic marketing that includes elements of both creativity and analytics. 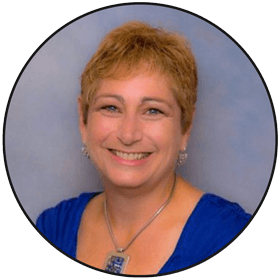 Professor Lisa Simon, an Orfalea College of Business faculty member since 1996, specializes in qualitative research, especially focus group moderation, and professional sales. 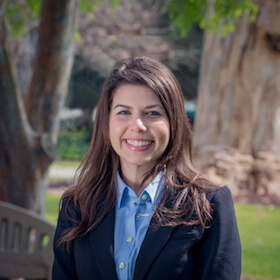 As AMAs Advisor, her role consists primarily of support and guidance, allowing students to learn through their own successes and failures and serves as a major resource for the board members.